My mother, if I haven’t already said, was a spiritual spelunker who believed in mediums, seances, angels, and the healing power of crystals. 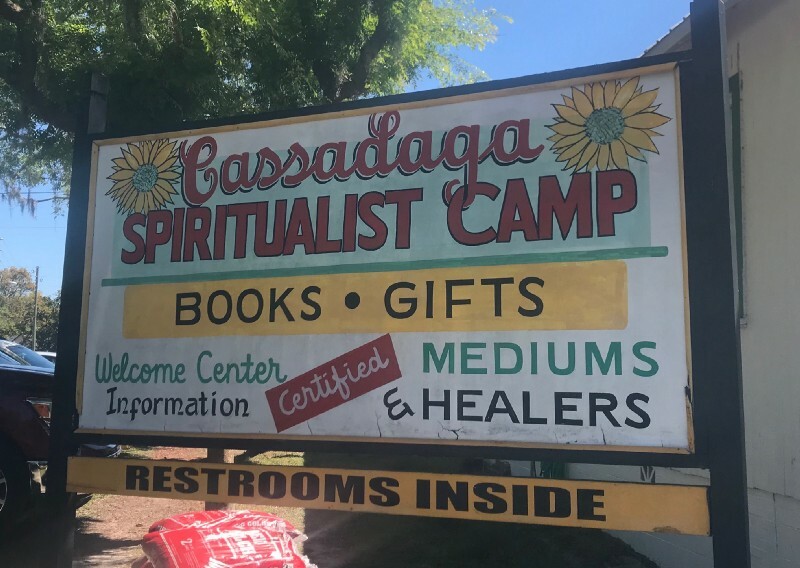 So a few months ago when I passed a sign for Cassadaga, a spiritualist camp founded in 1875, I decided to stop for a visit. I’ve been to Cassadaga before, though I’ve never gotten a reading. The place doesn’t seem to change: a lot of cottages from the 1920s with sun-bleached gardens and little signs in the windows identifying the mediums and healers living inside. There are chimes and dreamcatchers swaying in the breeze from roof eaves, and it all feels like a summer camp for psychics. Which is essentially what it is. A t-shirt with the Commodore 64 logo on the front. If it hadn’t been such a snap decision to go, I would have changed to a more neutral shirt. We sat in facing chairs and he took my hands to offer a prayer to a decidedly non-denominational spirit-force for help in reaching the truth. We then sat up and unclasped hands. He talked awhile about my “ministry,” which he hastened to point out wasn’t a literal one — just a vocation where I did good by communicating with others and looking more deeply into the universe. He said he saw a scientific curiosity in me that pursued the truth. For the rest of the half hour, he did a lot of free-associating with a repeating refrain of, “I want to talk about…” though we never really paused to do so. Which I have to admit is a pretty eerie summation of my mother’s reaction to most places and people, and perhaps not something intuitive to guess if all you knew was that she was a spiritual person. Like my mother, I’m a little disappointed, though maybe that’s okay. I’m not sure my stand on psychic phenomena is any different than it was when I arrived in Cassadaga. I was always honored that my mother would talk to me about it when she was alive, knowing I wouldn’t dismiss it out of hand, but the best I can muster in the way of belief is that there are intuitive things that some people can perhaps perceive in others that takes on the appearance of insight. I doubt (but hope) there is life after death, and I figured that if anybody would want to talk to me, it would be Mother. I’m not sure that she did, but I’m also not sure that the medium didn’t perceive something interesting and useful anyway. I may not pursue it as often as she did, but every now and then I like to check in on the paranormal in case it surprises me. I saw Solo yesterday afternoon and enjoyed it, but of course there are people on the Internet — that aching black hole of want — who find it disappointing because it didn’t sufficiently change their lives like others in the series. I’ll never be one of those people who say, “It’s only a movie” because I know that they can be life-changing experiences, but I’m 45 years old and I can count 18 movies that have altered the trajectory of my life in any meaningful way. That list ends in 1998. That’s not the last time a good movie was made, nor was it the last time I let myself by changed by stories. I think that was just when the engine of that change switched almost completely over to books. What’s my point? I suspect that when someone tries to make a movie to change your life, it is almost certainly doomed to fail. The ones that succeed are surprising and idiosyncratic, and the less you expect your life to be changed, the more it likely will be.